You might wonder why, having talked about time-travel and gravitational waves, I'm dealing with something so basic and ancient as the shape of the Earth. Surely nobody believes the flat earth hypothesis in the 21st Century? Actually, quite the opposite. Flat-earthism is getting more popular every year, especially online. As a few examples: the youtuber TigerDan925 (a flat-Earther) has over 26,000 loyal followers on his channel, the Flat Earth Society (along with many other organisations) has been rekindled under the leadership of Daniel Shenton and every day on Instagram I see hundreds of people passionately claiming that "globe-heads" are ignorant sheeple part of a global????? conspiracy. NASA photographs are all faked apparently, and the world's governments are prepetuating the round-Earth lie for all sorts of reasons, often to undermine the Christian Bible (which sometimes talks about the Earth being flat). How has this happened? Woah, dude, they might be onto something! If you've ever run across a flat-Earther you'll find they're not pitch-fork wielding yokels who cower at electricity. They're often well-spoken people who can defend their position with what sounds like good evidence. And that's part of the reason flat-eartherism appeals to many; their claims can be backed up with Scientific-sounding ideas. A lot of the videos and articles by flat-Earthers contain nuggests of genuine Science. The FES (Flat Earth Society) website makes frequent reference to things like "Earth's axis symmetry" and "the Northern annulus" which sound like terms you'd hear in a legitemate astronomy class. Some of their arguments are so good in fact, you can't immediately spot why they're wrong. Case in point: I'm a well-educated Scientist and I had a couple of moments researching this article where I went "hang on, how does a round Earth explain that?" Seriously, some of the flat-Earth arguments were so subtly wrong I didn't even notice where the mistake was at first! I'm quite proud of that incidentally, not ashamed. I would be a bad Scientist if I decided "flat-Earthers are wrong" before hearing their evidence. As it turns out, their evidence is flawed in numerous ways, but the fact I had moments of "hmmm, that's interesting" is proof, I think, that I really was going in with an open-mind. So, to any flat-earthers reading this blog, I come in peace, waving a white flag. When I first saw this I thought "hold on, that looks like Gauss' law and it proves that...ah, wait, no it doesn't." As it happens, those equations are being misused, but this doesn't look like the work of a lunatic, in fact the person who wrote this obviously has some mathematical training. Now, to be abundantly clear, every flat-Earth argument I've looked at crumbles under examination, but they often look fascinating, even to someone who knows what they're doing. One of the most interesting flat-Earth arguments I came across was actually on a German website and it said the following "das kabunkenfult ist der keine nicht; un spletze jarra die holten. Diese globe est eine kreiss mit der flatenzich." That's a very interesting sentence when you translate it into English. Except it isn't, because it's not a real German sentence. That sentence is fake. Sure, there are a few genuine words which you probably recognised, but if you aren't fluent in German, you wouldn't know. It works the same with pseudoscience. It's so much like proper Science that if you're not an expert you can't distinguish what's real from what's not. This is why a lot of sane, intellligent people end up believing things which are false. You hear technical words, see a few diagrams or equations, and if you're not careful, you can go along with it. Even the people perpetuating pseudoscience probably don't realise they're doing it. If you're not confident on Science (actually even if you are) flat-Earth arguments can be persuasive because, and it shames me to admit this, they're taught better than real Science! Most people are educated about the Earth being round by their parents before they even go to school. It's one of the first simple facts everybody learns: the Earth only looks flat because it's big and we're small. The problem is that most kids (myself included) are merely taught it and are never given evidence. Or, sometimes, the evidence given is wrong e.g. Columbus sailing around it, which can actually be explained on a flat-Earth. We also don't spend much time proving the Earth is round in school. As a high school Science teacher I barely mention it. I just assume primary schools and parents have done the job, allowing me to move on to other stuff (although after researching this, I'm going to change that). So, naturally, a lot of people grow up "knowing a fact" without the foundation for how we know it's true. When they come across clever-sounding flat-Earth arguments they find themselves questioning ther knowledge. Self-doubt is healthy and accepting facts dogmatically is not, so in a sense their decision is a sensible one. Because many people aren't equipped to defend the round Earth, they reasonably abandon it when counter-arguments are suggested. Flat-Earth arguments look like they're based on reason (albeit sloppy) and the round-Earth is usually dictated as "thou shalt know this fact", making the flat-Earth seem more appealing. This is something we obviously need to fix. I once overheard someone debating a flat-Earther and they said at one point, mostly out of frustration "Look, every Scientist believes the Earth is round, are you honestly going to disagree with millions of Scientists?" The flat-Earther responded, quite fairly, "yes". I don't agree with the flat-Earther's cosmology but I do agree with their stance: you don't have to agree with something just because a clever person says it's true, that's NOT how Science does things. Science isn't a democracy where we go with majority opinion. You're allowed to suggest any hypothesis provided you can a) test to see if it's right and b) are willing to back down if the evidence contradicts you. Science is a dictatorship but the dictator isn't "the head of Science" (there is no such job, fortunately), the dictator is nature herself. If you want to know the truth you don't trust someone who makes the claim, you test it. So, let's do that. How can we test that the Earth is round without relying on images from NASA, who would obviously be part of the conspiracy? If the Earth were flat you would be able to see across it, particularly at sea where there are no obstacles in the way. Yet we find our scope of vision comes to a limit after a few kilometers and using binoculars doesn't reveal more. Sitting in the Atlantic ocean of a flat Earth, you should be able to see America and Africa simultaneously, yet we cannot. You'll find flat-Earthers claiming this is to do with objects being so far away that they appear small, but the distances across horizons are often shorter than the heights of clouds which you can still see comfortably from the ground, so no dice there. Also, the higher up you go, the further you can see which wouldn't make sense if the Earth were flat. If Earth was a pancake, being higher up would give you no perspective advantage. Yet, we have a horizon - a limit to vision in all directions, which things appear over (rather than shrinking into) which we can see past only by raising altitude, as I've demonstrated in my beautifully drawn diagram below. Not to scale, obviously. 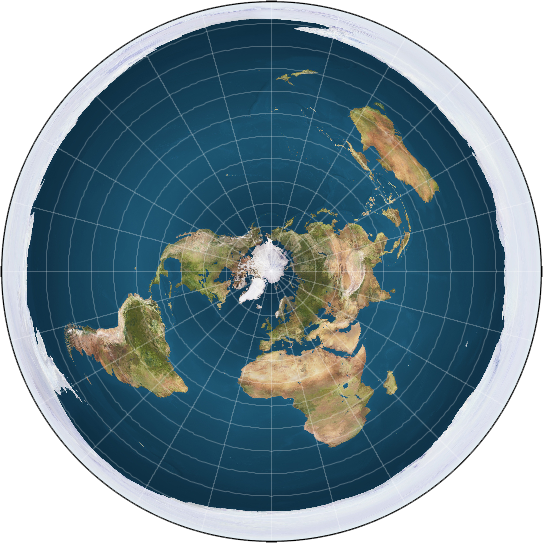 If the Earth truly was flat, the "northern hemisphere" would really mean the "inner circle" around the pole. Countries in the southern hemisphere like Australia are near the edge of the disc (as shown in the picture at the top of the blog). If the Earth is flat, people in these two circles will be looking at the same sky and while they might disagree on where the stars are, all the stars should be visible. But that's not what we observe at all. In Sydney, for example, you can't see Ursa Major, which everyone in Europe is pretty familiar with. There are some parts of northern Australia where you can see it at certain times of year (again near the whole Horizon thing) but in the South, you just can't. Likewise, from northern Finland you can't see The Southern Cross (which Australians are so familiar with they have it on their flag). Now to be fair, flat-Earthers point out that Australians and Europeans will see stars in different places because they're both looking "up" at different points of the Earth's surface, and I agree with them, but it doesn't explain why some stars are completely hidden. If you and a friend stand on opposite sides of a room and look up, you will see a different part of the cieling above you, you'll disagree on where the light-fixture is but you both still see the light, it's not hidden from anyone. But what we experience in reality is that some features of the sky cannot be seen in the North and vice versa. How can two people both look upwards, yet be looking in the opposite direction? Their "grounds" must be opposite to each other as well i.e. they are standing on opposing sides of the Earth. Here we get the timezones occuring in the right order and day/night cycling back and forth. The Sun hovers above the Earth and goes around in a constant circle, with the moon in opposition. This does solve the day/night problem, but it raises countless others (not to mention how the moon is sometimes visible during the day). I'm going to ignore the problem of having a Sun that size (short version: it's not possible) because I want to stick with simple proofs anyone can test. And there are plenty of ways in which the above can't be right. Firstly: This isn't how light works. Get a torch and shine it down on a plate. You'll notice that one part of the plate is forming a little circle of "daytime" - fine. But lower your head to the plate and look up. You can still see the torch, even from the dark regions. On a flat Earth, the Sun should be visible, even during night-time. There's also the problem with the shape of that light patch - it's an oval. It has to be in order for day/night times to occur at the right times, but why would a spherical Sun be creating an oval light patch? This isn't what light does. The only way to get an oval shap from a spherical light source is to have the ground curving...which defeats the whole point of the flat-Earth. Simply put, the flat Earth model means you also need to reject the theory of light as well. Secondly: This wouldn't explain sunsets. If the Sun were moving around in a circle like that, we'd see it getting smaller and smaller as it got more distant, before gradually growing in size as it "rises" again. But that's not what happens, the Sun stays the same size - suggesting it's always the same distance from us. Sunsets just wouldn't happen in the above picture. Thirdly: Circular motion doesn't work like that. For an object moving in a circle, some kind of influence must be pulling it toward the centre (what's called the centripetal influence). You can prove this by swinging a ball on a string and notice that the force pulling on the ball is your hand. If the Sun is looping around in circles, there must be some kind of force pulling it in toward the centre, and there isn't anything hovering over the North pole. Every so often (as perfectly predicted by the round-Earth model) the moon is shadowed by some object. This can't happen with the flat-Earth because there is nothing between the Sun and moon. In the flat-Earth view the moon always has direct line of sight to the Sun so nothing should ever get in its way. Flat-Earthers do accept this criticism incidentally, and so have come up with a solution. There's another object floating above us: the shadow object. We've already seen there must be a third object in the sky holding the Sun in place (completely invisible), but now we need a fourth to explain lunar eclipses. This object interacts with sunlight (in order to cast a shadow) yet is somehow invisible from Earth - implying it doesn't interact with sunlight? The same is true the other way round. Solar eclipses can happen in the middle of the day i.e. the Sun is directly overhead and some object drifts in front of it, obscuring it from Earth. There's no doubt the object causing Solar eclipses is the moon (we can watch it happening) so to create a solar eclipse in the above model, the moon would have to spontaneously duck out of it's orbit, drift across the planet and go UNDERNEATH the Sun. When solar eclipses happen, nobody reports seeing the moon shooting across the sky to get in position. Interestingly, the FES does address the issue of the lunar eclipse by inventing the shadow object (and also making sure it breaks the known laws of optics), but they are strangely silent on the issue of a solar eclipse...apart from a few who pose the existence of yet another heavenly body "the anti-moon". Take a look at the beautiful image above. You can see the sun setting (bottom half disappearing first, then top half) and interestingly, the light is hitting the undersides of clouds. 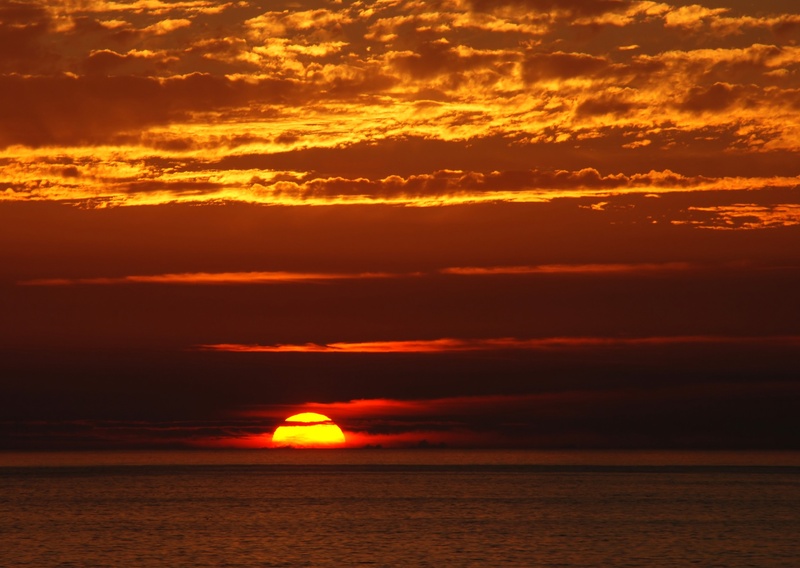 You can watch this phenomenon during almost any sunset. Now here's the thing, according to the Flat-Earth model, the Sun is circling above the clouds. Even if we somehow accept that the sunset is an illusion (I don't, but let's just say) how could we explain the Sun, above the clouds, illuminating them from below? It can't be reflection on the sea's surface because reflected light always bounces off at the same angle it hits (i.e. the sun's rays would be too low to hit the clouds), yet somehow we get illumination on the underside. If you've read any flat-Earth literature (and I've recently read a lot) they have clever-sounding answers to the above problems which, without fail, explain it as a side effect of "refraction" or "perspective". Refraction causes light to change direction when it goes from one substance to another and you've probably done experiments with prisms in school, or seen straws appearing in wierd places in glasses of water, or swimming pools seeming shallower than they really are. This is the kind of thing refraction can do. Perspective is what makes objects look smaller as they are farther away. However, according to flat-earthism, refraction is some magical phenomenon which allows light to bend and twist in any way you can think of. Sunsets, sunrises, eclipses and the horizon are all explained in flat-earthism with a simple "because of refraction and perspective" defence. But refraction and perspective can't make the Sun move down when it should get smaller, it can't make the top of an object appear before the bottom, it can't bend light upside down to illuminate clouds, it can't make stars invisible and it certainly can't bend shadows. But, let's just say, let's just say we accepted flat-Earthers claims that refraction and perspective explains away all my evidence above. The next five tests don't have anything to do with either of them. This one's a really easy test. When you heat water it moves around more. It also expands and turns into vapour, leaving the pot and carrying away into the air. The more air above you, the harder it is to get the water to leave the pot. By contrast, the less air above you, the easier it is to force the water upwards (less air fighting it back down). The idea that water boils at 100 degrees is only half the story because it actually boils at lower temperatures when you're on top of a hill (less air above you so less heat energy needed to overcome it), and if you put it under lots of pressure (like a pressure cooker) you can have water well over 100 degrees in liquid form. Straight away you can see the problem. The atmosphere is very high near the north pole, but less high near the southern tip of Africa or Australia. In other words, water should boil at a higher temperature the further north you go (the higher the dome is above you). People in Sweden should be able to boil water at 120 degrees for instance, and people in Australia perhaps closer to 115 degrees or something (probably a more dramatic difference). But that isn't what we observe. Water's boiling temperature is constantly 100 degees at sea level wherever you are. The only way of changing it is to go higher. And, what's more, the change in height is the same everywhere you go. You can check it for yourself but it's every 290 meters climbed, shaves 1 degree off your boiling temperature. And that principle is also true everywhere - suggesting the height of the atmosphere is the same everywhere. This couldn't happen in a flat Earth. High-tides occur because the water is moving away from land and forming a sort of watery-hill in the middle of the ocean. Explaining this is impossible under a flat-Earth model (I'll get to why in point 10) but even more problematic for the flat-Earth is that high tides occur on opposite sides of the world simultaneously. Explaining one tide on a flat-Earth is just about doable. You could talk about the Earth tilting, the moon somehow pulling on the water (not using gravity though), but to explain why there are always two tides at different "ends" of the flat-Earth is something I've never heard a flat-Earther give a satisfactory explanation for. When you look through a large amount of air you see something different to what you get looking through a small amount. In an airplane, the sky often looks darker above you than it does near the horizon. At sunset, the sky near the horizon looks orange/red while the sky above looks a darker blue. During daylight, the horizon usually looks a bit paler than the sky overhead. There are all sorts of effects going on in these examples but the conclusion is the same every time: thin air is a different colour to thick air. Now go back to our flat-earth dome. Someone in the north pole should see an even distribution of sky colour because they're right at the centre. But if you live in southern Australia, things are very different. Cast your eyes north and you're looking through ten-times the atmosphere you'd be looking through if you look to the south. The sky should look different colours in different directions. In fact, anywhere on Earth (except for at the pole) you should see this effect, one horizon should be a different colour to the other, because one involves looking through less air. What we actually experience is a uniform sky colour everywhere. The horizons match during the day and only change during sunset/rise. What kind of shape could possible explain the fact that everybody seems to be looking up at the centre of a dome? This one gets a bit complicated, but I'll cut out all the mumbo-jumbo and keep it simple. Magnets always have a North and a South pole. It's impossible to get a lone North-poled object for instance, because if one direction is North, the other must be South. By definition, magnetic fields always cancel each other out at both ends and you can't have what are called "magnetic monopoles" (Dirac if you're reading this, shut up). The Earth has a huge magnetic field which we can test using compasses. The Flat-Earth has the idea of a North pole covered, that's the point where all the magnetic field lines connect. What it has difficulty with is the South pole. In the flat Earth model, there is no such point as the South magnetic pole so the entire rim of the world has to act as the South pole in order to explain compasses; the field lines branch out from the centre and that's why our compasses point along these axes. There are a few problems with this straight away in terms of how magnetism works, but let's just be generous and say it could happen. You could imagine a bunch of bar magnets all glued together in a wheel with their North poles pointing to the hub. This magnetic wheel now presents us with three major problems. First problem: Field Lines Take two compasses and have them parallel to each other at the equator. Except, it turns out you can't do that. In a flat earth model, the magnetic field lines are all pointing away from each other at angles, so two compasses on the equator (which I've drawn below as the black rectangles) will point in different directions. Parallel compasses or magnets would be impossible on a flat Earth. But let's just say we could do it somehow, let's ignore that problem and assume we somehow could put magnets parallel to each other at the equator, maybe they're really close to each other, too close to see the divergence. As we walked toward the South pole, the magnets are going to follow different field lines and will eventually turn out to be pointing toward two different parts of the South pole - they would spread out. But that's not what happens. Firstly, the magnetic field lines are parallel at the equator and they end up pointing toward each other the further South you go. How can we have magnetic field lines being parallel at the equator, but converging on a point the further South you go? On a ball, as shown below. Second problem: Aurora Australis You've heard of the Northern lights and the mechanism is pretty simple. When the Sun ejects clumps of high-energy particles they go flying into space and sometimes get caught in Earth's magnetic field. As they get funnelled in toward the North pole, they end up crashing into the atmosphere. The result is a beautiful light show. It happens at the North pole because that's where the magnetic field lines are pointing. In a flat Earth, you'd expect these lights to happen at the North pole where the magnetic field is most concentrated, but not at the south pole where the magnetic field is weak. And yet, we do get a light display there, often at the same time as the Northern lights. Many explorers in the Southern region of the world have seen the Aurora Australis for themselves and you can too - it's a bit of a stretch of the term "testable" but you're already walking across the world holding two compasses, why not see the lights as well? The problem is that the South pole in a flat-Earth is too weak to cause the lightshow. It's the same amount of magnetism, just stretched over a large diameter (the edge of the disc). The only way to make the South pole more magnetic, and permit the lights, would be to introduce lots of "south poles" on their own, but since magnetic monopoles aren't a thing, this is impossible. No way round it I'm afraid, Southern Lights shouldn't exist on a flat-Earth. Third problem: a Flat Earth shouldn't be Magnetic anyway There's a good reason for the Earth to have a magnetic field. A large sphere of liquid iron is constantly rotating around an inner core of sollid Iron (and Nickel). This grinding of two large ferromagnetic bodies means a lot of electricity is being moved around, and when you have moving electricity you have a magnetic field. In other words, it's a byproduct of electricity moving in a sphere. There's no other way to generate a magnetic field that big. A round earth comes with a satisfactory explanation for why it has a magnetic field - which matches everything we know about electricity and magnetism (and can test). A flat earth provides no explanation for why the Earth even should be magnetic in the first place. How would a magnetic field be generated on a disc? There are two reasons Flat-Earthers think gravity doesn't exist. The first is that any object has a centre of mass, a point which gravitationally pulls other objects toward it (I'm simplifying it a teensy bit there A-level physicists). The centre of Earth's mass is in the centre obviously, and gravity points toward it. In a round Earth this is no problem because anywhere you stand gravity pulls you inward toward the core. But on a flat Earth gravity would pull you sideways at the edges of the world. Australian gravity would happen at an angle and it clearly doesn't. Flat-earthism and gravity don't go together. So rather than abandon flat-earthism, they abandon gravity. Secondly, gravity pulls things into a sphere. That's what it does. Every Sun in the sky, every planet, every moon, every pulsar, every quasar are all round. Gravity pulls in all directions and so, like a piece of paper crumpled from all sides, everything gets rolled into a ball. A big flat object (like a flat Earth) couldn't exist for long. It would buckle under its own size and gravity would crush it together to form a spheroid. In other words, gravity is the ultimate flat-Earth killer. So, naturally, flat-Earthers reject it. As it says on their website "objects simply fall". In 1774 a group of Scientists carried out an experiment (repeated countless times by enthusiastic physicists and one you can do it yourself) where you hang a pendulum next to Schiehallion mountain in Scotland and the pendulum doesn't hang straight down, it tilts toward the mountain. Of course it does, the mountain has mass, so it has a gravitational pull and causes things to tilt as they fall, rather than in a straight line toward the earth. Objects do not simply fall. You can watch the moons of Jupiter through a telescope orbiting their planet in a circle. Gravity is the only way to explain this circular motion. Objects do not simply fall. The tides show the entire ocean gradually lifting up and pointing toward the moon wherever it moves. Objects do not simply fall. The infamous Cavendish experiment (which you could also replicate) shows two large spheres being attracted to each other, not toward the ground, because of their gravitational attraction. Objects do not simply fall. We can watch, through our telescopes, clouds of dust being pulled together to form Suns, woven by some invisible all-pervading force. Objects do not simply fall. And even if they did, even if they did, why isn't the Sun falling toward the Earth in the flat-Earth model?? If objects simply fall, then there is nothing holding the Sun up and it should just crash into us, along with the moon, the shadow object, the anti-moon and so on. As we showed earlier, a Sun moving in a circle needs to be held in place by something. It can't be gravitationally attracted to the moon because gravity doesn't exist in flat-Earth world. The tides can't be explained by the moon's influence either. Ultimately, the flat-Earth theory has to reject gravity, but in doing so, you also abandon the concept of day and night as well. No matter how you look at it, gravity is the nail in the flat Earth coffin. Believing in the flat-Earth isn't simple. In order to match what you see to the flat-Earth, you have to also give up on light and optics. You have to reject the first law of thermodynamics. You have to reject the existence of tides. You have to reject electromagnetism. You have to reject gravity. And all these ideas are testable and endlessly verified. Yes, some of the things flat-Earthers point out are puzzling at first, and some of them don't have immediately obvious explanations. But I'm afraid that's all they are - quirks of perception which can be explained with a better Scientific understanding. Round earth theory has survived not because Scientists said it was true, but because it accounts for every bit of evidence, making countless testable predictions. The Earth is round and anyone saying otherwise is not crazy, or stupid, they just don't understand the gravity of their claim. Pun intended. James out.